It is not a bad CV/resume. He has some archaeology and volunteering experience but there are several problems with it. Here is some advice I gave him that is applicable to anyone just starting out in archaeology. Put the most valuable skill/experience/certificate first i.e. drivers license or CSCS card. Why? – entry level jobs might have hundreds of applications… in the first hour of a job being up. They may only spend 15-30 seconds on a CV/resume (some employers tell me it is closer to 5-10 seconds). That means they will only look at the first few paragraphs and you want them to see the most important aspect that will get you a job. Find out what that is, it will differ from job to job, and put it there. For a UK Commercial Archaeology Digger that important aspect(s) are a Drivers license and CSCS card. Why are are these important or the most important? Many archaeology projects involve undertaking watching briefs, watching a JCB scrape back the topsoil while you look for archaeology, it remote locations that require someone to drive to the location. Being able to drive to those jobs makes you more employable. Also, as of 2016, only 41% of 20 year olds have a full license. That increases to age 70% by age 3o* but it means if you are just out of University probably half of your peers won’t be able to drive. That means you will be better than half the people applying for the same position. A CSCS health and safety card will also help you get an entry level job in UK commercial archaeology. More info at the CSCS website. Why do you need the card? Well you need one to work on construction sites and many excavations take place on construction sites . Jeremy didn’t have a card but he is going to get one. NOTE- as of in September 2017 the current method for getting a CSCS card will be changing. You can read about the changes at the CIfA website. 2. Pages- no more than two except when it should be longer. Get your most important information on the first page (see above). 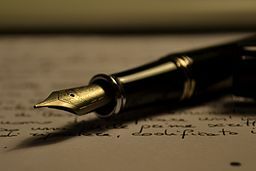 Why– again people will spend 15-30 seconds looking at a CV/resume so it is unlikely they will read more than a page or two. That is not to say all you CV/resumes should be just two pages. As you move up in archaeology fewer people apply for supervisor and project manager jobs and so employers have more time to review applications. The more information you can give employers the more likely you are to get hired… usually, there is a such a thing as too much information. When you are starting out a good rule of thumb is two pages. In a few years you can add more pages. 3. Put in and expand excavation experience. This is were one explains what archaeology skills they have. I would recommend instead of saying 6 weeks say June-Aug. 20xx it gives more details. Also, put any relevant experience including volunteering. If you are just out of University most of your experience will be volunteering INCLUDE IT. Put what specific skills you have: i.e. basic survey equipment competence (TST, dumpy, gps etc. ), field recording methods, report writing (indicate which elements you did), photography, finds & sample processing, statistics, geography & geology, and IT skills – particularly any databases, illustration, GIS and CAD programmes that you can use competently or have worked with. Why– People don’t know what you did. 3 months field school… ok, so you did what then? … drink a lot? visit a beach? or did you spend 3 months immersed in archaeology 24/7 learning everything you will need to be the best archaeologist in the world? I don’t know what you did, they won’t know what you did. You need to tell an employer what you can do and what you have learned from your experiences. This is how you demonstrate you can do the job they want. 4. If you have any additional practical skills or qualifications – motor maintenance, IT, outward bound stuff, languages, first aid, electric tools, any training in site tours/dealing with the public. Why– every bit helps. You never know when an extra skill/qualification may get you the job over someone else. Why– because if they can’t find what they need to on your CV then what is the point? It is important to know that a drivers license and CSCS will not get you a job by themselves. What they will do is that when someone is going through CV’s looking for someone with a drivers license or CSCS card they will stop and say oh well this person had it. Do I want to spend another hour looking through CVs when this person has some experience? The answer is almost always no. If you are just starting out you will never be able to beat out other applicants on experience but you still need some- volunteering helps. What you are hoping for is that your CV is what they are looking for at the right time. You would be surprised how many people get calls not because of experience but because their CV was on the desk of an employer when they needed to hire someone. Which brings me to… start applying for jobs now, you students about to graduate. Most companies will keep a list of diggers and slowly work through it as jobs come up. It’s best to get on people’s radars now. Also, do not wait for jobs to come up, cold call all the companies in your area and send in your CV about every month/other month to prospective employers. THIS is how you get a job. A CV/resume will help but 90% of the work comes from being in the right place at the right time and 90% of that comes from being on top of things and getting your CV in and keep sending it in (don’t be annoying by sending it your resume/CV every day). Most CV/resumes have a life of about a month before it is buried and thrown out, probably less but in some cases more. 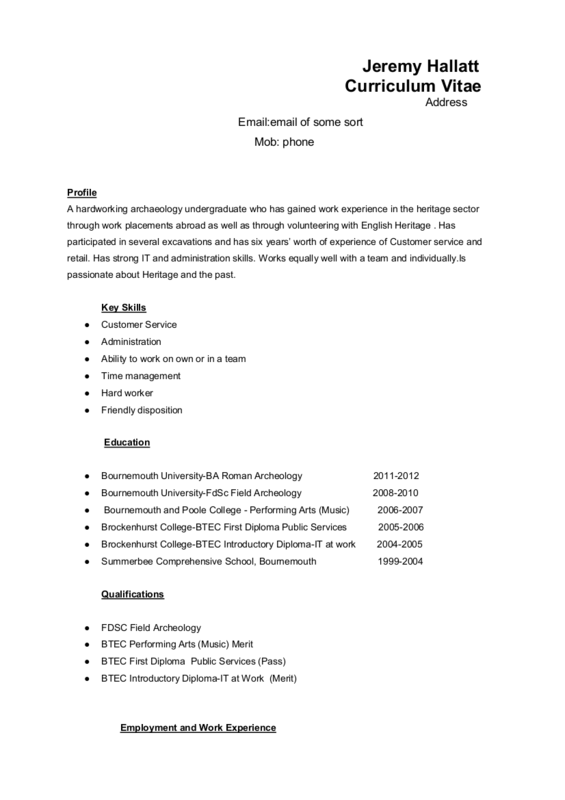 I would also say make a second CV aimed at heritage sites/museums/councils etc. to apply to and keep your options open. 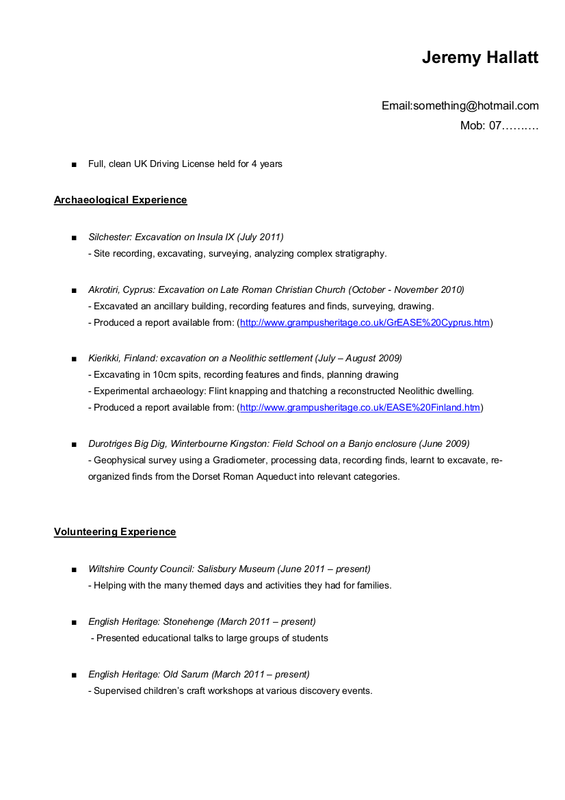 There are lots of archaeology related jobs that are not in the commercial sector that you can get involved in BUT you need to tailor your CV/resume to jobs. A drivers license or CSCS card won’t help you land that museum job so you will need to change that around and put up what will get you the job. 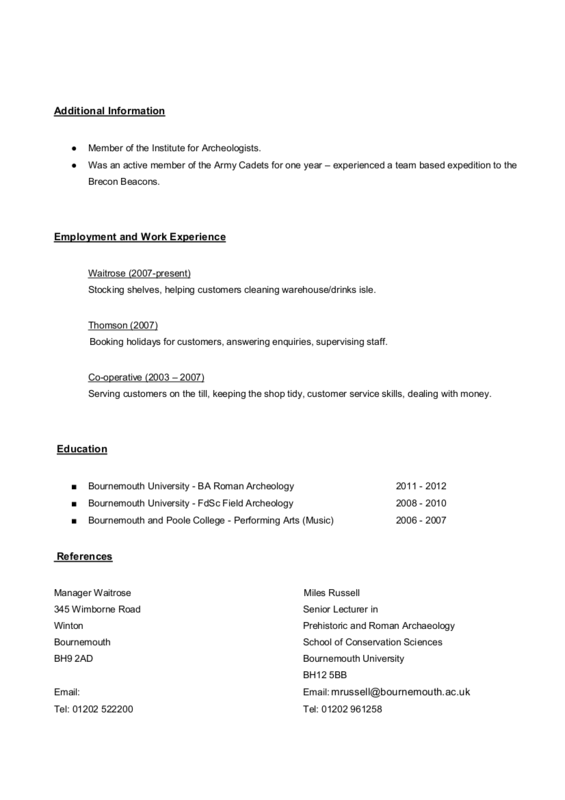 Even with your archaeology CV tailor if for every job. If they ask for skills in GPS and you have that then move that experience towards the top of your CV. 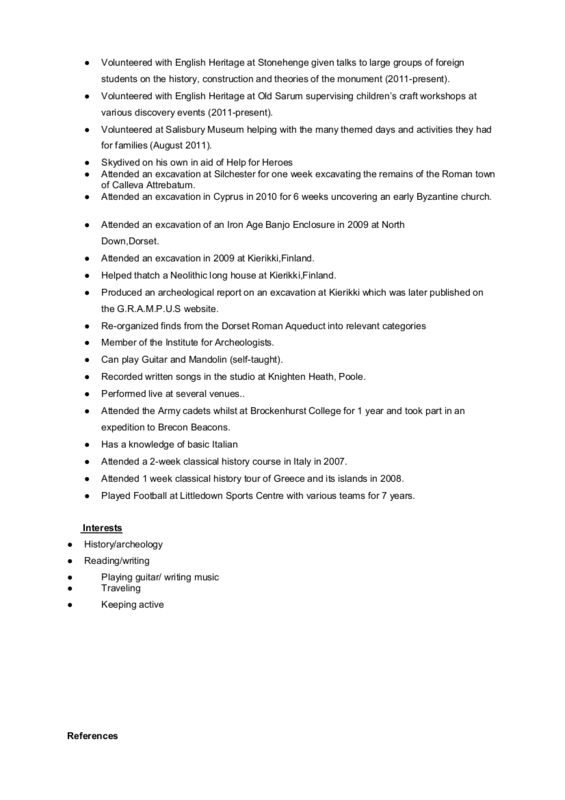 Here is Jeremy’s revised CV. If anyone else has pointers to give please speak up. *I got those numbers by taking the number of people with driver licences against number of people in an age group. 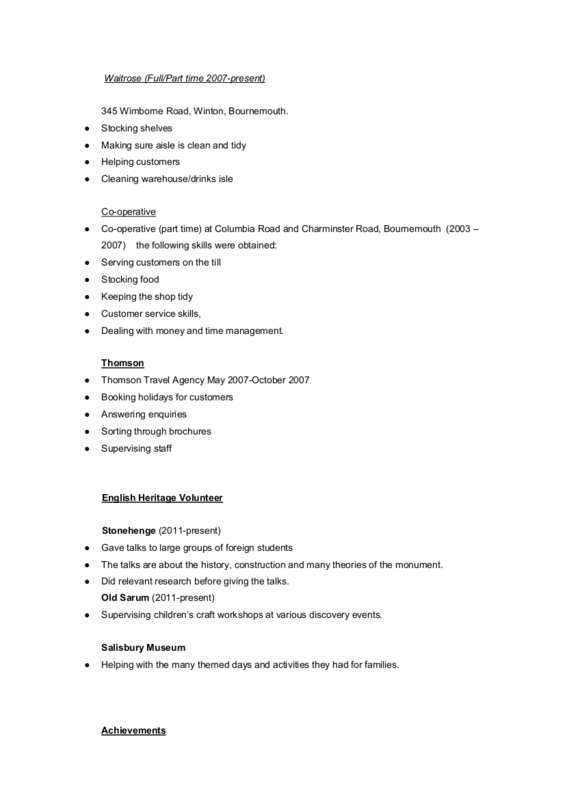 For a site assistant post, it might also be worth putting what specific skills you have: i.e. basic survey equipment competence (TST, dumpy, gps etc. ), field recording methods, report writing (indicate which elements you did), photography, finds & sample processing, statistics, geography & geology, and IT skills – particularly any databases, illustration, GIS and CAD programmes that you can use competently or have worked with. If you have any additional practical skills or qualifications – motor maintenance, IT, outward bound stuff, languages, first aid, CSCS, electric tools, any training in site tours/dealing with the public – do note these. 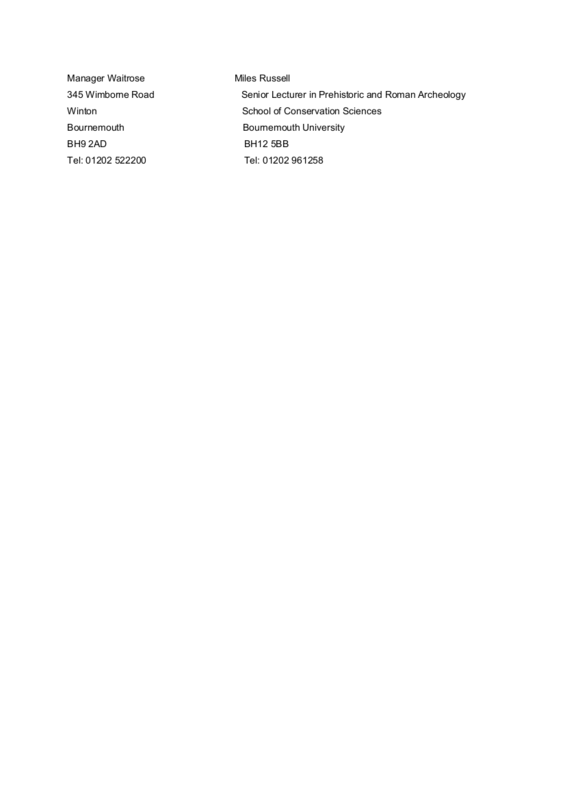 Where it says ‘Member of the Institute for Archaeologists’, it might be an idea to indicate whether the grade is Student/Affiliate or a corporate grade – Practicioner, Associate, or Member. The current sentence might be interpreted as suggesting full MIfA corporate grade. Put your degree etc. results. The actual grade doesn’t necessarily matter – but the absence of clearly stated marks can get your CV put on the ‘mysterious gaps & misinformation’ pile. No reasonable employer expects an expert at this stage, and a good employer/colleagues will help staff to build on their skills and training. Sometimes in addition to the driving license + CSCS, the hook can be a hiring person’s simple interest in a particular training dig or curiosity about your experience of thatching and mandolins! Also – Font 11+ or other clean font is good, it is well-spaced – make sure the indents are consistent.